Home / Posts Tagged "Corporate film production"
Irwin Video have completed the fourth promotional video in a series of films for CoreRFID. Cheshire based CoreRFID have been very pleased with the series of promotional films that we have produced for them. This year alone, CoreRFID have commissioned four case study films which show how their clients benefit from their RFID products and services. 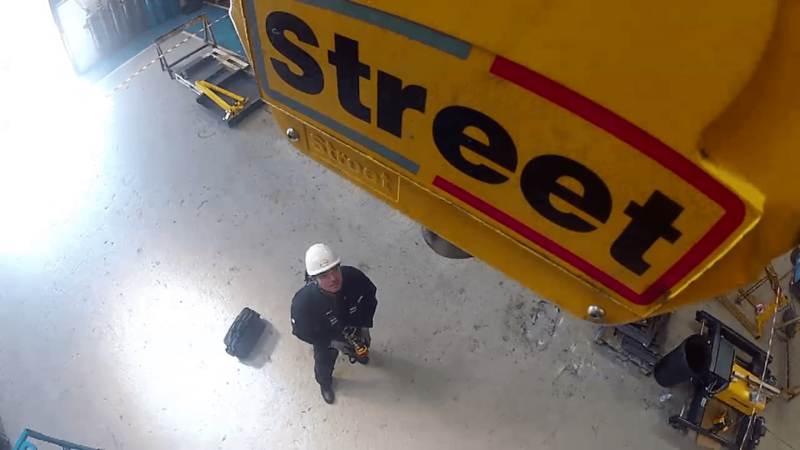 The latest promotional film case studies Street CraneXpress, a Sheffield based company which uses CoreRFID’s CheckedOK for its lifting equipment inspection system. Filming took place at Street CraneXpress’s offices and workshop. Director Eddie Irwin and camera operator Steven Thomas began with filming an interview with James Eastwood, the Operations Manager at SCX. The crew then staged a number of scenes which included filming one of SCX’s engineers inspecting crane equipment. A SCX employee was also drafted in to play the role of a customer. One of the shots involved mounting a camera to a hoist and lowering the camera towards the engineer on the ground. Some additional filming was later arranged at CoreRFID’s offices in Warrington, to film a brief interview Richard Harrison, their Technical Sales Director. At the editing stage, the answers from the interview with James were carefully edited to create the narrative for the film. Shots from the engineer and customer scenes were creatively overlaid. Music and titles were then added to produce a highly engaging and informative promotional video. This promotional film was the fourth in a series of case study films produced for CoreRFID this year. The first case study film was filmed in Selby, North Yorkshire, and featured CoreRFIDs asset management tracking system used by Industrial Chemicals Limited. In the summer, we travelled to Ireland to film a further two case study films with Hoistech Ltd and Assess Ireland. Visit our video production page to watch these films and other examples of our work. Video, if done well, has the power to boost customer engagement and undoubtedly help to convert sales. It is now well known that search engines love video, so adding video content to your web site will also help increase web traffic. Irwin Video provide high-quality, good value video production. We make creative corporate films that will not only provide engaging content for your website or trade stand, but will also present your company with the professional image it deserves. We take care of the scripting, filming, editing and final delivery of your video, to produce a video which will create a great impression to your customers or clients. We can also produce foreign language versions of your film, using subtitles or foreign voice-over artists, helping you to reach out to customers in overseas markets.